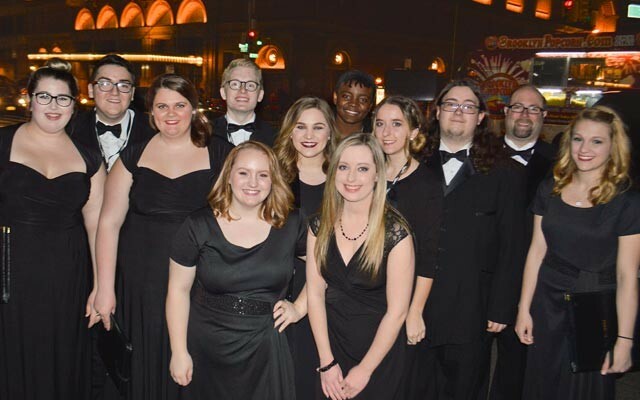 Eleven Illinois Central College music students had the opportunity to travel to New York City and sing in a 272-person choir on the main stage of the famous Carnegie Hall! Singing with the First United Methodist Church Peoria IL Sanctuary Choir – the students experienced all that New York has to offer culminating in an unforgettable performance at one of the most prestigious venues in the world! The group participated in the concert “Between Heaven and Earth” featuring a choir composed of singers from Norway, Portugal, Italy, England, and the United States. Students of the ICC Chamber Singers singing with the choir from First United Methodist Church in Peoria, Ill. submitted an audition recording and were selected by Distinguished Concerts International New York. Congratulations to our amazing student singers and choir director Doug Grogan!